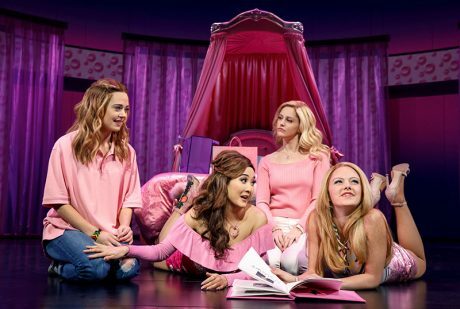 Movie-to-musical adaptations have become an overcrowded playing field on Broadway, but Tina Fey’s song and dance rendition of her hit 2004 film, Mean Girls, is an unexpected delight. Updated to reflect social media saturation and the #metoo and Time’s Up revolution, it traces the journey of an awkward teen named Cady whose family has moved her from the wilds of Africa to socially predatory suburbia. She gets swept up in the popularity of the “mean girls” at school but learns that there is a personal price to pay for wanting to stay at the top of the heap. A big reason why this peppy production breezily zips through an impressive number of transitions is the video work of Fray Studios co-founders and creative partners Finn Ross and Adam Young. If Ross’ name sounds familiar, it is because he has three shows on the Great White Way right now, the others being Frozen and the two-part Harry Potter and the Cursed Child. 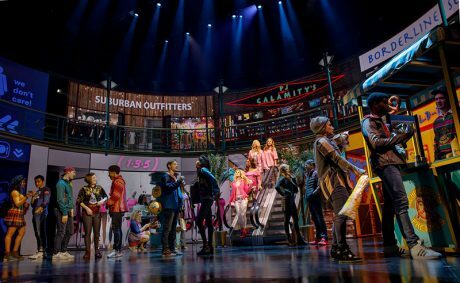 In Mean Girls, he and Young use a two-tiered semi-circular back wall with various sliding panels and six LED screen legs to create many environments that look realistic and mesh well with the musical milieu onstage. Ross recalls that he got the first call for the show in November 2016, but proper work on the production did not begin until March 2017 for the out-of-town rehearsals for the original production. This was held at the National Theatre in DC and ran between Oct. 31 and Dec. 3, 2017. 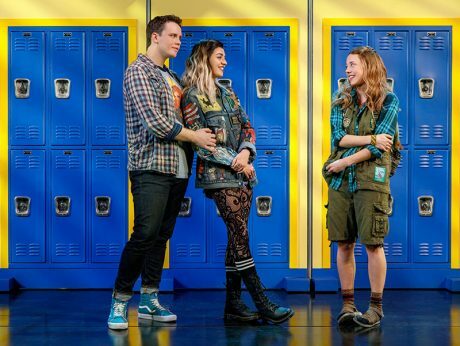 Young adds that he was brought on board at that time by scenic designer Scott Pask, who had worked out the horseshoe staging that allowed for an LED wall intersected by five different entrances onstage, the fifth one being a hidden upstage center portal that opens for select and dramatic entrances, particularly the arrival of the three “plastics,” who are the show’s titular divas. Mean Girls hurtles through many different environments — bedrooms, classrooms, a mall, a Halloween party, a Mathlete tournament, and much more. The digital backdrops are enhanced by highly colorful and effective props that help to create the necessary environmental illusion for each scene. Being that Fey is a TV and film writer, the scenes are fast-paced and change often, which is not uncommon on Broadway lately. 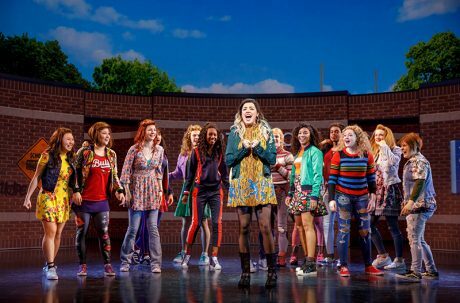 In days’ past, musicals simply went from one number to another, but now it feels like a cast is in the midst of one number while transitioning into another. Employing LED screens allowed them to create a richer blend of colors within the bright lighting that projections could not, especially given that bright pink is an essential ingredient to the color palette. 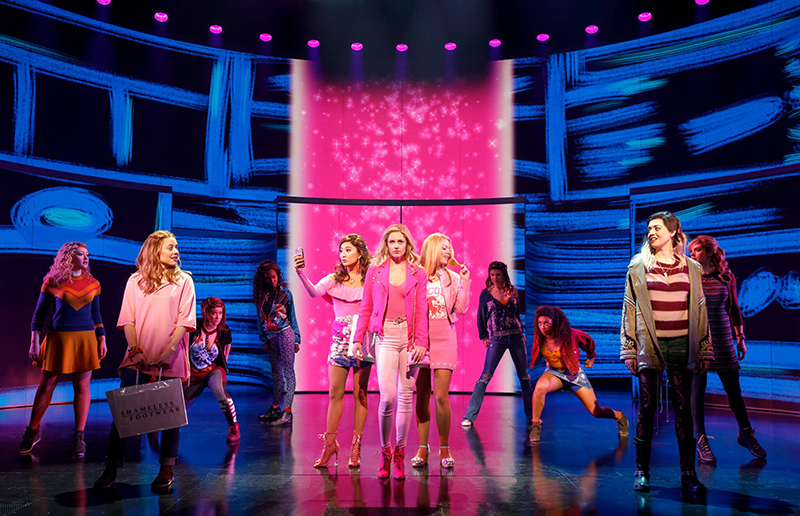 Scott Pask also wanted to cover all the screens that form the set in pink-tinted Perspex, which muted the harshness of the LED in the theater and allowed for banding-free color. Young explains that the video content is used at times to represent the various characters’ psychology. “Art freak” character Janis has scenes that are “hand-drawn with streaky markers, and everything feels rough and unpolished,” says Young. “When our ‘Queen Plastic’ Regina is still the most popular girl in school, her ‘video worlds’ are very pink and sparkly. However, later in the show, when she’s seeking her revenge for her social exile, we shift into a ‘Bond’ inspired world which, while maintaining her color, is less pretty, more stark, and holds a harsh and aggressive energy.” Further, the social media wall show presented before each act and during the show provides a colorful tapestry of messages that are still easy to read even as they fill the video space. While the backdrop of the cinder block walls at school look very natural, it took the designers a lot of time to get those details right. “We were literally lit on stage with a tape measure, measuring in reality how big a cinder block would be, how big a brick would be, and how big a tile would be,” recalls Young. “I was counting pixels. You had the size that the audience would be perceiving it at and make sure it looked right. I was trying to make things look close to reality in terms of scale and color.” Both Ross and Young got a lesson in American high school aesthetics. In their native England, they do not have lockers. And in America, school colors are on display everywhere.